Once your heel tip wears down to the metal nail and you hear that irritating clicking sound, the best option is to visit a reputable shoe repair shop ASAP. However, this isn’t always feasible for many. 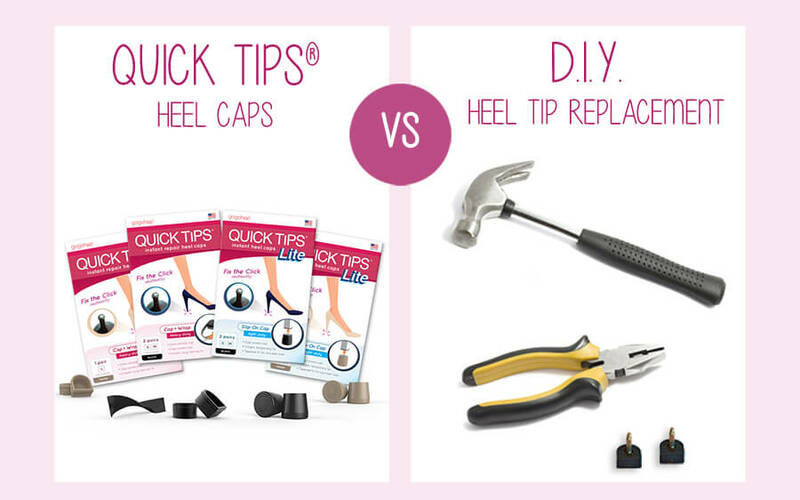 With busy schedules, cost factor, and shoe repair shops becoming less accessible, it is no surprise that heel lovers everywhere are looking for easy D.I.Y. solutions. TOOLS REQUIRED: None. Pliers and hammer. Sandpaper/file, drill, and/or super glue may all be required. SHAPE: Cap fits over various heel tip shapes including round, square and triangle. Rubber heel tips come in various shapes: D-shaped, round, oval, rectangular. APPLICATION TIME: Under 1 minute. At least 10 minutes without complications. If you cannot remove the old heel tip, you’ll need to go to a professional shoe repair. 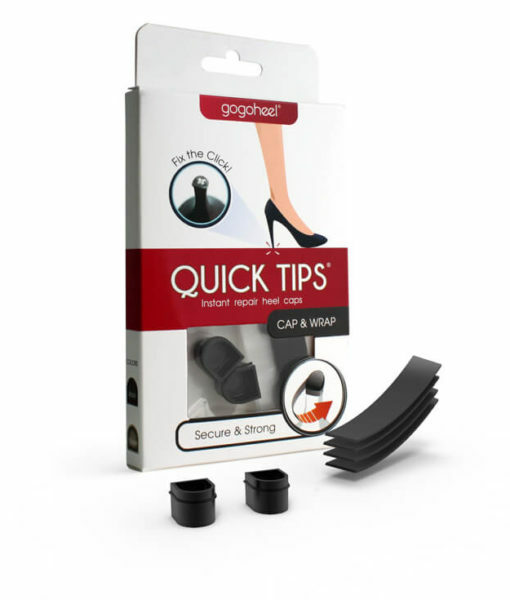 APPLICATION: QUICK TIPS® Cap and Wrap: Heavy-duty cap locks onto heel with no-residue, self-fusing wrap. Watch video demo. 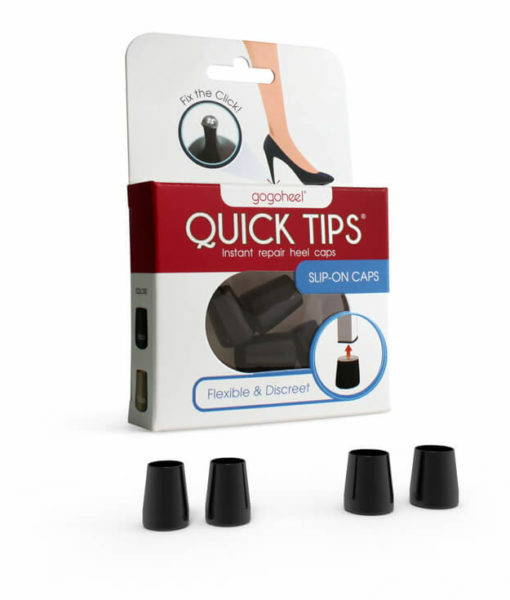 QUICK TIPS® Slip-On Heel Caps: Push tightest fitting cap over worn heel tip. Using pliers, remove the old heel tip and hammer in a new tip. RISKS: None. 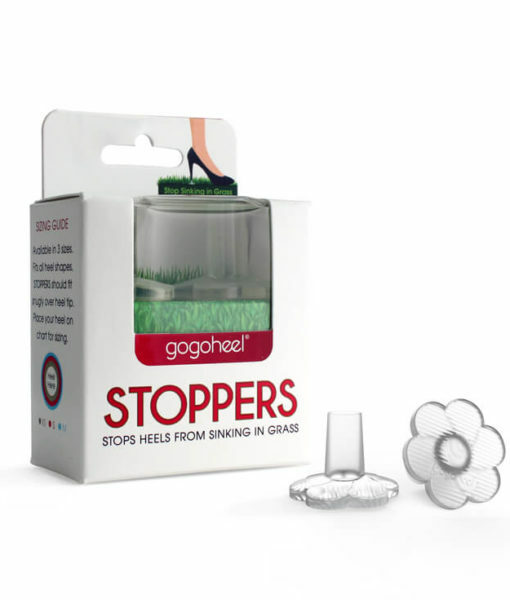 The cap goes over your existing heel tip, and the band is residue free. Removing the old tip is very difficult and risks damaging the heel in the process. Also note that ensuring the correct pin size is very important. Heels may split if the pin is too thick! Pin sizes for new heel tips vary between 2.5mm – 3.3mm. FINAL APPEARANCE: QUICK TIPS Cap and Wrap is reasonably discreet. QUICK TIP Slip-On Caps is very discreet. Good, dependent on correct heel tip/pin size that is chosen. This entry was posted in Shoe Repair and Care and tagged DIY, heel tip repair, heel tip replacement, popular, shoe repair.